Grinding Services are metal finishing operations which use abrasives to remove material from round and square objects usually with a high degree of precision. Grinding can normally produce better accuracies than traditional single point machining operations such as turning. Grinding services usually rely on diamond, cubic boron nitride, or other similar wheels which are composites of abrasive grains and binders. These wheel rotate against spinning or stationary work pieces and the grains provide a continues source of small cutting edges as they break off. Wheel dressing is an important aspect of grinding. Grinding has applications for both small lot manual methods and high production rate operations with automated feeding. Some processes lend themselves inherently to automated feeding. Grinding can be used for hardened materials and for metals that are difficult to machine. Depending on the grinding machine employed, grinding services use the face of the wheel or its perimeter. Grinding of cylindrical and other rounds shapes almost always uses the perimeter of the wheel. Grinding of flat surfaces can use either depending on the setup of the machine. Some operations, such as dual disc grinding, use only the faces of the wheels. Basic grinding operations include plunge, through feed, and creep feed. In plunge grinding the wheel engages the work piece without moving across it. Through feed is a centerless grinding method where parts are fed continuously along the length of the grinding wheel. In creep feed surface grinding, the wheel makes a single pass at its final depth. 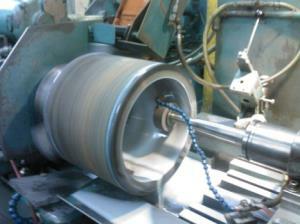 The selection of grinding wheels is every bit as important as the selection of the grinding process itself. Wheels come in a variety of widths and diameters, grain types and sizes, etc. Dressing tools are dressed to true them, to keep the grinding grains sharp, and in some cases to form the wheel into the final shape of the ground part. Dressing is normally done offline, though some advanced grinding techniques dress the wheel during the actual grinding process. Cylindrical Grinding encompasses ID and OD grinding where parts are held between centers or in collets or chucks as well as centerless grinding where parts are supported by the grinding wheels and from below. Double Disc Grinding uses two usually large diameter wheels and grinds both faces of typically flat parts at the same time. Surface Grinding is an equivalent of cylindrical grinding for flat surfaces. Usually the spinning wheel is held stationary and the work is passed beneath it on a traversing table, making several passes and incrementing the depth of the cut or a single pass with a deeper cut at a slower feed rate. Thread Grinding is a specialized thread making process used primarily for ball and lead screws where the precision of the thread form is important for positioning applications.